Villa Rocco is an old renovated stone house located in the village Kozljak, on the western slopes of the mountain Ucka and distant approx. 11 km from the sea. Besides the beautiful view that Ucka offers, the guests of Villa Rocco will also enjoy in the breeze coming from Ucka during the hot summer days. The house was built 1920 and was fully renovated in 2005. 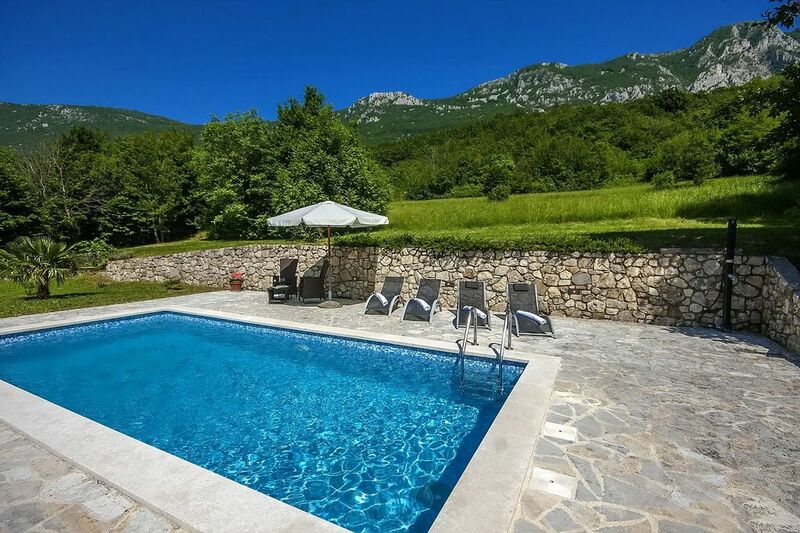 Situated on a beautiful private plot of about 5000 sqm full with sun and shadows, offers to its guests a pool of 32 sqm, covered terrace with barbecue and dining table and parking for 2 cars. House for 5 persons with a total living area of 96 sqm situated on two floors. At the ground floor there is a spacious dining area with fireplace and within it there is a fully equipped kitchen, double bedroom, shower/toilet and exit to the terrace with barbecue. At the first floor there is a cosy living area, bedroom with one double bed and one single bed, shower/toilet.